Context: Bryophyllum pinnatum is used as traditional medicine in India, Africa, Tropical America and China for treatment of various diseases. B. pinnatum contains different groups of phytoconstituents viz., flavonoid, terpenoids, alkaloid, phenolic compounds. Aim: The present study was carried out to evaluate the gastroprotective activity of B. pinnatum whole plant aqueous extract, and mucilage (MUC) isolated from the whole plant against ethanol induced gastric ulcer. Materials and Methods: Pretreatment of rats with aqueous extract at dose level of 500 and 750 mg/kg b.w., MUC at 500 mg/kg dose level and standard drug Rabeprazole at dose level of 20 mg/kg b.w. where given for 7 days. 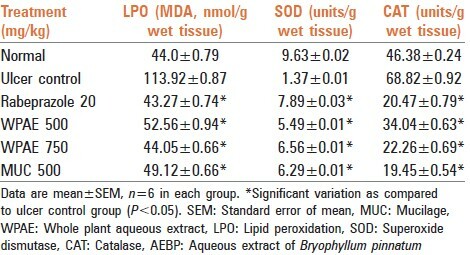 Results: The aqueous whole plant extract of B. pinnatum at dose of 750 mg/kg p.o. and MUC at dose of 500 mg/kg p.o. markedly decrease the incidence of ulcers in ethanol induced ulcer rats. In ethanol induced ulcer rats, there was a decrease in the gastric volume, free and total acidity and ulcerative index as compared to the control group. Total carbohydrate content was found to be an increase as compare to control the group. The aqueous whole plant extract of B. pinnatum at dose of 750 mg/kg showed a significant reduction in the above parameters which was comparable to the standard drug rabeprazole (20 mg/kg). B. pinnatum extract and MUC showed protection index 72.69 and 69.65% respectively, whereas standard drug rabeprazole showed protection index 75.49%. Conclusions: Whole plant extracts of B. pinnatum and MUC has potent gastroprotective effect which can be further clinically studied for new drug development. Bryophyllum pinnatum (Lam.) Kurz. is a medicinally important plant having different group of phytoconstituents with a wide range of pharmacological activities. Leaves of B. pinnatum has been reported to have flavonoid, phenolic compounds, alkaloids, terpenoids, carbohydrates, minerals and glycosides. Lightly roasted leaves are used against cancer, inflammations and a leaf infusion for fevers by Creoles. Mixture of leaf juice with coconut oil is used as a remedy for migraines and headaches in Palikur. The Siona indigenous people heat the leaves and apply them topically to boils and skin ulcers. Rio Pastaza natives in Ecuador, use a leaf infusion to treat broken bones and internal bruises. Infusion of leaves and stem in cold water are used by indigenous tribes of Peru for heartburn, urethritis, fevers, and for all sorts of respiratory conditions. The root infusion is also used in epilepsy. In Kerala, tribals use plant for treating cancer symptoms. Leaves of B. pinnatum are known for their antinociceptive, anti-inflammatory and antidiabetic activity,  antihypertensive activity,  immunosuppressive effect,  anti-tumor activity. Antiulcer potentials of herbal drug have been reported in various scientific studies. There is a need to evaluate the potential of Ayurvedic remedies as adjuvant to counteract side effects of modern therapy. In the present study, isolation of mucilage (MUC) from the whole plant and gastroprotective effect of aqueous extract of whole plant has been evaluated on ethanol induced ulcer model (rats). Whole plant of B. pinnatum was collected from Kalyan, Maharashtra in the month of March 2010. Plant was authenticated from Blatter Herbarium, St. Xavier's college, Mumbai by Dr. Rajendra Shinde. The plant material was washed, and excess water was drained off and dried on filter paper. Shade dried plant material was crushed in electrical mix grinder to a fine powder, and it was further used for the studies. Five-hundred gram of whole plant was defatted with petroleum ether and exhaustively extracted with distilled water for 7 days (changing distilled water every day). The content was filtered through Whatman filter paper No. 1 and evaporated to syrupy content at 95 ± 2°C and labelled as an aqueous extract of B. pinnatum (AEBP). This extract was used for gastroprotective study. Two hundred and fifty gram of whole plant was extracted in distilled water by boiling it in the water bath at 100 ± 2°C for 2 h. and kept for extraction for 4 days in mechanical shaking. The content was filtered and concentrated. Equal amount of ethanol was poured in the concentrated aqueous extract to obtain faint red precipitate; precipitate was washed with acetone and oven dried at 45 ± 2°C. Isolated MUC was further hydrolyzed in 1 M H 2 SO 4 to separate the sugar subunit present in it and was characterized by gas chromatography-mass spectroscopy (GC-MS), Fourier transform infrared spectroscopy (FTIR) and nuclear magnetic resonance (NMR). Thirty-Six healthy female Wistar rats weighing between 180 and 250 g were used in this study. Animals were maintained at 25 ± 2°C and kept in well-ventilated animal house under natural photoperiodic condition in polypropylene cages with paddy husk as bedding with free access to food and water ad libitum. The experimental protocol was approved by the Institutional Animal Ethical Committee (IAEC NO: MVC/IEAC/04/12) and the study was conducted in accordance with CPCSEA guidelines. The animals in group 1 served as control and received 1.0 ml of phosphate buffer saline (PBS). The animals in groups 2 and 3 received 2000 mg/kg b. w. of AEBP and MUC respectively through oral administration with a cannula attached to a graduated syringe. They were all placed under observation for 30 min, 4, 24 h and post 14 days and cage side observations were recorded. Six groups (n = 6) of female Wistar rats were used to study the Gastroprotective activity of AEBP. PBS, aqueous extract (AEBP), rabeprazole (20 mg), MUC and ethanol were administered to the animals per orally (p.o.). Group 1: Received PBS (10 ml/kg) through the experimental period (7 days) and served as control. Group 2: Received PBS (10 ml/kg) for 7 days and served as ulcer control. Group 3: Received rabeprazole (20 mg/kg) for 7 days. Groups 4 and 5: Were respectively administered with 500 and 750 mg/kg AEBP for 7 days respectively. Group 6: Was administered with 500 mg/kg of MUC for 7 days. After collecting the gastric contents and measuring the UA, small pieces of stomachs from each group were embedded in paraffin wax. Sections of 5 μm thick were cut in a microtome and mounted on glass slides using standard techniques. After staining the tissues with H and E stain, the slides were viewed under a light microscope equipped for photography. The stomach was then examined under microscope (×100) to observe erosions and scored as 1-5: 1 - Small round hemorrhagic erosion, 2 - Hemorrhagic erosion <1 mm, 3 - Hemorrhagic erosion = 1-2 mm, 4 - Hemorrhagic erosion = 2-3 mm, 5 - Hemorrhagic erosion >4 mm. The score was multiplied by 2 when the width of the erosion is larger than 1 mm. After postoperative period, animals were sacrificed by cervical dislocation and the stomach was dissected out as a whole by passing a ligature at the esophageal end. Gastric content was evacuated into a graduated tube by cutting along the greater curvature of the stomach, and was centrifuged at 3000 rpm for 10 min. The fundic part of the stomach was homogenized (5%) in ice cold 0.9% saline with a glass homogenizer for 30 s. The homogenate was then centrifuged at 1000 rpm for 10 min followed by centrifugation of the supernatant at 12,000 g for 15 min and the obtained fraction was used for the estimation of lipid peroxidase, superoxide dismutase (SOD)  activity and catalase (CAT)  activity. Acute oral toxicity was carried out fixed dose method. It is found that AEBP and MUC were found to be safe at dose 2000 mg/kg with no mortality in studied subjects. Cage side observation was found to be normal in AEBP and MUC groups. Body weight, food and water intake of AEBP and MUC were found to be normal. Ethanol administration in rats (1 ml/200 g b.w.) induced ulceration of the gastric mucosa of the control group, characterized by hemorrhagic gastric lesions. AEBP and MUC caused a reduction in the severity of these lesions induced by ethanol which was evident by a significant (P < 0.05) reduction in the ulcer index and an increase in the percentage protection of ulcers when compared with the control group [Figure 1]. At 500 and 750 mg/kg b.w. AEBP showed a protection index of 67.23% and 72.69% respectively and MUC at 500 mg/kg b.w. dose level showed protection index of 69.65% [Table 1]. The results were comparable to rabeprazole (20 mg/kg) which reduced the ulcer index significantly [Table 1]. The control group of rats treated with absolute alcohol showed histopathological changes of the gastric mucosa characterized by loss of glandular architecture, edema and erosions of the epithelial layer, evident edema, congestion and infiltration by inflammatory cells. 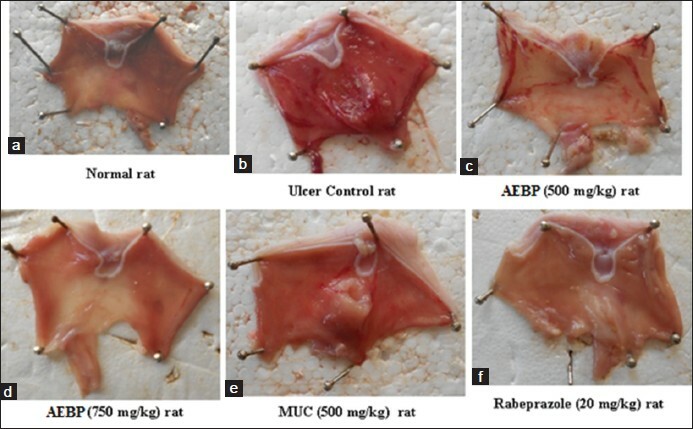 The rats treated with the AEBP at 500 mg/kg, b.w. Showed minimum ulceration and edema but gastric epithelium was not intact. However, at a dose of 750 mg/kg the rats showed significant regenerative changes indicating healing [Figure 2]. Gastric volume, pH, free and total acidity and total protein content of gastric juices in the AEBP treated groups indicated that there was a significant decrease at 500 and 750 mg/kg respectively. Similarly, MUC at dose level of 500 mg/kg b.w. Also showed a significant decrease in comparison to the control group (P < 0.05). Rabeprazole at 20 mg/kg also caused a significant decrease [Table 2]. Total carbohydrate content in rat treated with AEBP at dose level 500 and 750 mg/kg b.w. And MUC (500 mg/kg) showed significant increase in comparison to control group (P < 0.05). The results are tabulated in [Table 2]. The results revealed that at dose levels of 500 and 750 mg/kg, AEBP decreased the CAT activity, and lipid peroxidation (LPO) level significantly in the glandular tissue, when compared to the control group. The activity of the group treated with 500 mg/kg of MUC was comparable as that of animals treated with Rabeprazole at 20 mg/kg (P < 0.05) [Table 3]. Superoxide dismutase activity in the glandular tissue was found to be significantly increased at dose level of 500 and 750 mg/kg of AEBP and MUC at 500 mg/kg b.w. As compared to control group (P < 0.05). The results are tabulated in [Table 3]. 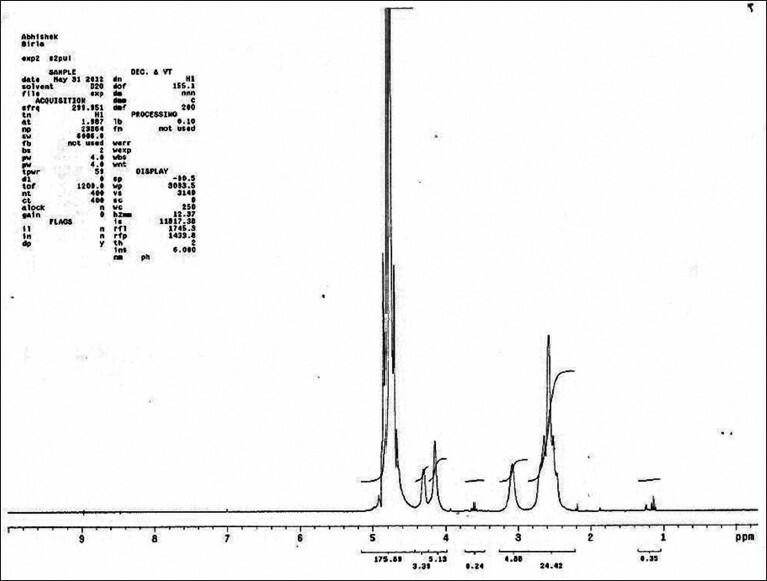 1 H NMR spectrum at 70°C of the partially depolymerized polysaccharide [Figure 3], containing uronic acid, showed signals at 4.87, 4.52, 4.37, 4.06 and 3.88 ppm which were assigned according to the literature to H 1 , H 5 , H 4 , H 3 and H 2 , respectively of α-D galactopyranuronic acid units. The signal at 5.25 and 1.28 ppm was assigned to the anomeric and methyl protons at position-6, respectively, of a-L-rhamnopyranosyl residues. 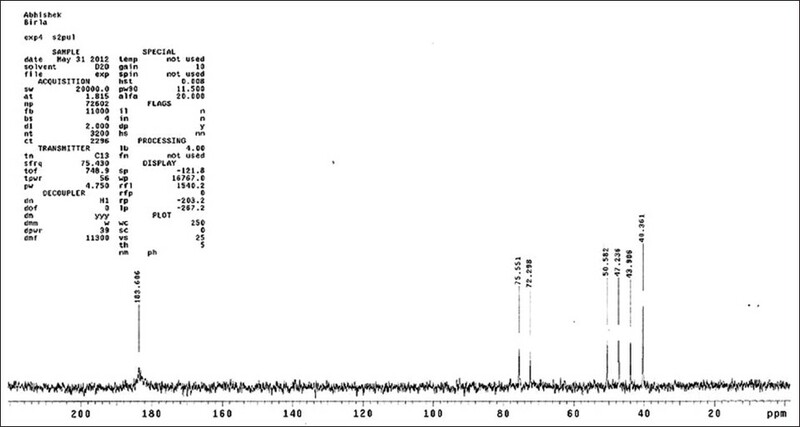 In the 13 C NMR spectrum [Figure 4] a signal at 183.46 ppm was assigned to the carbonyl carbon of the carboxyl group. The gastroprotective effect AEBP and MUC were evaluated by ethanol induced gastric mucosal damage. AEBP and MUC reduced the ethanol induced lesions in the gastric mucosa as was evident from the significant (P < 0.05) reduction in the ulcer index in comparison to the ulcerated control group. The results were comparable to Rabeprazole, which reduced the ulcer index significantly. Histopathological study of the aqueous alcoholic extractives confirmed the antiulcer activity. The gastric mucosal epithelial cells are impermeable to hydrogen ions and therefore form a physical barrier. This may have contributed to the mucosal defense mechanism as was evident from increased carbohydrate/protein ratio and an increase in carbohydrates like hexose, hexosamine, fucose and sialic acid. Reactive oxygen species plays a role in the etiology and pathophysiology of inflammation and gastroduodenal ulcers. From the data of ethanol induced ulcer model, it was found that the AEBP and MUC effectively increased the enzymatic antioxidants such as SOD and CAT. Conversely, it decreased the LPO level which suggests an antioxidant effect of the extractives. From the results of antisecretory model, it was found that AEBP and MUC decreased the ulcer index in the doses used. AEBP and MUC decreased total carbohydrate, in the gastric juice compared with the ulcerated control group. On the other hand, the AEBP and MUC decreased the aggravating parameters such as gastric volume, total protein, total and free acidity in the gastric juice and increased the gastric pH. These findings suggest that AEBP and MUC show good gastroprotective effect in the ethanol induced ulcer model. Bryophyllum pinnatum extract could significantly protect the gastric mucosa against ethanol-induced injury. Such protection was shown to be dose dependent as ascertained by the reduction of UAs in the gastric wall, as well as the reduction or inhibition of edema and leucocytes infiltration of sub-mucosal layers. Protection of gastric mucosa was most prominent at a dose of 750 mg/kg extract. Further, MUC isolated from B. pinnatum showed potent gastroprotective effect which when analyzed using NMR revealed the presence of galactopyranuronic acid units. In future AEBP and MUC can further be clinically checked for new drug development for the treatment of gastric ulcers. The authors express gratitude to the staff of the SAIF, IIT-Bombay for providing GC-MS, NMR and FT-IR instrumentation facilities which was helpful in interpreting the results. Patidar DK. Anti-ulcer activity of aqueous extract of Murraya koenigii in albino Rats. Int J Pharm Biol Sci 2011;2:524-9. Dashputre NL, Naikwade NS. Evaluation of anti-ulcer activity of methanolic extract of Abutilon indicum Linn. leaves in experimental rats. Int J Pharm Sci Drug Res 2011;3:97-100. Thirunavukkarasu P, Ramkumar L, Ramanathan T. Anti-ulcer activity of Excoecaria agallocha bark on NSAID-induced gastric ulcer in albino rats. Glob J Pharmacol 2009;3:123-6. Clouatre D, Rosenbaum M. The Diet and Benefits of HCA. New York: Keats Publishing; 1994. p. 23-32. Kamboj A, Saluja AK. Bryophyllum pinnatum (Lam.) Kurz. : Phytochemical and pharmacological profile: A review. Pharmacogn Rev 2009;3:364-74. Ojewole JA. Antinociceptive, anti-inflammatory and antidiabetic effects of Bryophyllum pinnatum (Crassulaceae) leaf aqueous extract. J Ethnopharmacol 2005;99:13-9. Ghasi S, Egwuib C, Achukwu PU, Onyeanusi JC. Assessment of the medical benefit in the folkloric use of Bryophyllum pinnatum leaf among the Igbos of Nigeria for the treatment of hypertension. Afr J Pharm Pharmacol 2011;5:83-92. Bergmann BR, Costa SS, Borges MB, Silva SA, Noleto GR, Souza ML, et al. Immunosuppressive effect of the aqueous extract of Kalanchoe pinnata in mice. Phytother Res 2006;8:399-402. Supratman U, Fujita T, Akiyama K, Hayashi H, Murakami A, Sakai H, et al. Anti-tumor promoting activity of bufadienolides from Kalanchoe pinnata and K. daigremontianaxtubiflora. Biosci Biotechnol Biochem 2001;65:947-9. Nie SN, Qian XM, Wu XH, Yang SY, Tang WJ, Xu BH, et al. Role of TFF in healing of stress-induced gastric lesions. World J Gastroenterol 2003;9:1772-6. Lowry OH, Rosenborough NI, Farr AL, Randall RJ. Protein measurement with Folin phenol reagent. J Biol Chem 1951;193:265-75. Goel RK, Chakrabarti A, Sanyal AK. The effect of biological variables on the anti-ulcerogenic effect of vegetable plantain banana. Planta Med 1985;85-8. Panneerselvam S, Arumugam G. A biochemical study on the gastroprotective effect of hydroalcoholic extract of Andrographis paniculata in rats. Indian J Pharmacol 2011;43:402-8. Repetto MG, Llesuy SF. Antioxidant properties of natural medicine for gastric ulcers. Braz J Med Biol 2002;5:523-34. Repetto MG, Llesuy SF. Antioxidant properties of natural compounds used in popular medicine for gastric ulcers. Braz J Med Biol Res 2002;35:523-34. Malairajan P, Gopalakrishnan G, Narasimhan S, Veni KJ, Kavimani S. Anti-ulcer activity of crude alcoholic extract of Toona ciliata Roemer (heart wood). J Ethnopharmacol 2007;110:348-51.